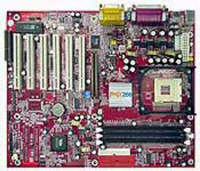 Combining numerous high end features such as an onboard Promise FastTrak 100-Lite IDE RAID controller and support for high bandwidth DDR266 SDRAM, the VIA P4X266 PR22-R mainboard provides the ultimate platform for building the highest performance 478-pin Intel® Pentium® 4 processor based systems, workstations, and servers. Based on the highly acclaimed VIA Apollo P4X266 chipset, the VIA P4X266 PR22-R features a 400MHz Front Side Bus and supports a complete range of 478-pin Intel® Pentium® 4 processors running at speeds of up to 2GHz and above. With three 184-pin DIMM sockets onboard, the VIA P4X266 PR22-R can accommodate a maximum of 3GB DDR266 SDRAM delivering data transfers rates of up to 2.1GB per second. Overall performance is further enhanced by the VIA Apollo P4X266's high speed V-Link bus, which doubles communication bandwidth between the chipset's North and South Bridge to 266MB per second. Based on an ATX form factor and measuring 30.5cm x 24.5cm, the VIA P4X266 PR22-R provides one AGP4X port, six PCI slots and a CNR slot for unbeatable scalability. In addition to an onboard AC'97 audio controller, this high-performance board also comes with a full set of I/O ports, including up to 6 USB connections, as well as Ultra ATA-100 and Hardware Monitoring support. High performance, feature rich VIA Apollo P4X266 chipset based ATX motherboard for the 478-pin Intel® Pentium® 4 Processor combining high bandwidth DDR266 SDRAM support with onboard RAID and Audio support.